Life as it really is! As blogged about at Clasheen the last couple of weeks have really been totally taken over by golf, Open Week duties and a wonderful ‘Felt and Nostalgia’ workshop with Jeanette Sendler. Thankfully I discovered the wonderful world of Jane Thornley’s freestyle knitting and this has given me a textile related fix in the evenings when I have been too tired to felt or do anything else except collapse on the couch. Coming from a felting background I must confess to being a total natural fibre snob but it has been quite a revelation discovering some of the new environmentally conscious yarns and exploring all the different renewable or recycled sources that they have been created from. Freestyle knitting encourages a playful sense of stitch and colour combining, nothing is forbidden and mistakes get turned into successes, my kind of style! Yarns that I previously thought horrendous can, (horrendous being a subjective term) in combination with more restrained fibres can have the ability to lift the knitting and give a little pop to an otherwise plain piece of work. Deciding that nothing ventured nothing gained I ordered a batch of oddities at knock down prices from Kemps Wool Shop just as an experiment and as soon as they arrived Carmen (we had been felting together when the post came) oohed and aahed over some of the more whacky offerings! Immediately we looked at each other and simultaneously decided that a freestyle scarf in peachy teracotta tones would be my hand made Christmas gift for Carmen!!! Here is a picture of it as it progresses on the needles. The bamboo tape is an absolute dream in the hand, beautifully soft and in lovely rich shades but I suspect it will not be the easiest to weave in and secure the ends, not worrying about that at the minute however! The yarn that has been the biggest revelation is Patons ‘Coast’ in soft teracotta (they call the shade salmon), it is a polyamide, acrylic, cotton mixture with little ‘tags’ sticking out and I am finding it gorgeous to knit with. Kemps is a wonderful online shop if you are looking for cheap and unusual yarn, my package of 14 balls only came to £15.96 including P&P and I will be definitely ordering from them again! AMAZING package all the way from New Zealand, I am in love! This afternoon as I am trying to recover from the last few weeks frantic activity and sort out paperwork and loose ends (always have piles of them hanging around!) the most amazing package arrived in the post all the way from New Zealand! I can’t emphasise how excited I was as each item was revealed from this colour swap via Ravelry, my swap partner Jayne went to HUGE trouble and expense putting together a parcel that was me to a T. I am still in shock at how gorgeous all the items were!!! Incredibly beautiful Midnight Orchid batts and a stunning hand made button! These Midnight Orchid batts are made by a lady local to Jayne and the stunning glass button is made by an Australian lady living in Sydney, how lucky am I????? 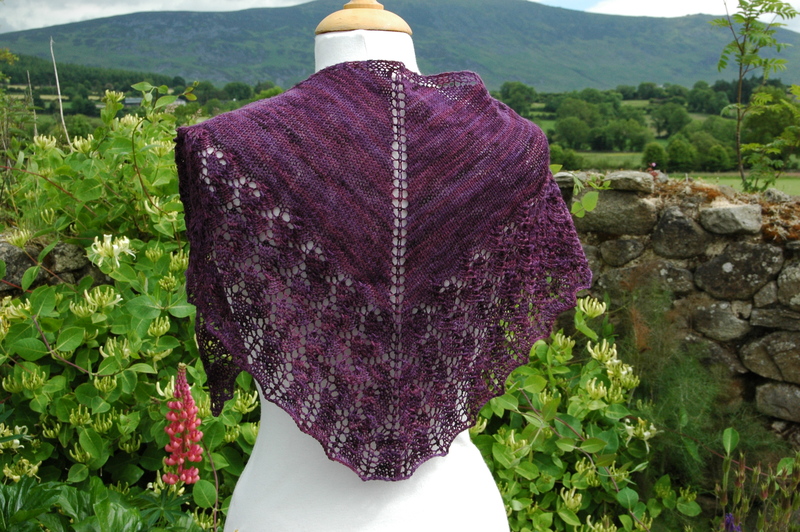 Stunning hand dyed and knitted lace wrap, how beautiful it looks in the Irish landscape! 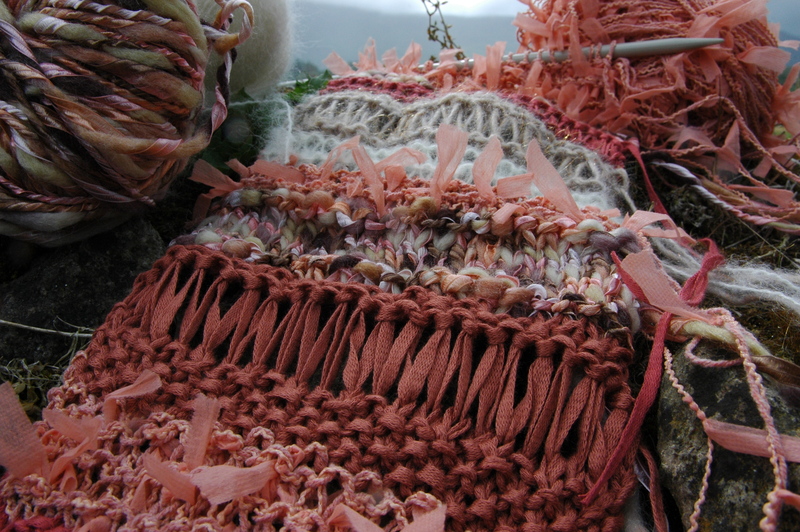 Crazy cowls from gorgeous weavers waste! Far too much going on at the moment with not enough hours in the day to write about it properly either here or on my main felting blog Clasheen but I just HAD to share with you my latest happy accident! On Friday evening and Saturday morning some American fibre friends called to visit with me and we had a great time discussing all things Ireland and all things wool, yarn and felt related. I am not going to mention their names yet from a security point of view until I know for sure they arrive safely home but as soon as I know their 4 week trip to Ireland and the UK is over I will link through to their website and hopefully you will see all the exciting textile adventures that they have been filming along the course of their travels. I have just lost all the rest of this post in the publishing and unfortunately I really don’t have enough time to write it all again. Forgive me for the resulting brevity now but what I really wanted to mention was the gorgeous weavers waste I picked up at Cushendale Woolen Mills over the weekend. These balls of wide wool ‘yarn’ are off cuts from the selvedge edge of some of the mill’s woven home textiles and wearable wraps, I think that they knit up into wonderful and funky cowls! Check out Flickr for some more detailed images of this lilac and an ocean blue cowl but if anyone is interested in purchasing one of these cosy and fun pieces I am happy to bill you directly through PayPal at a total cost of $38 including P&P to anywhere in the world! 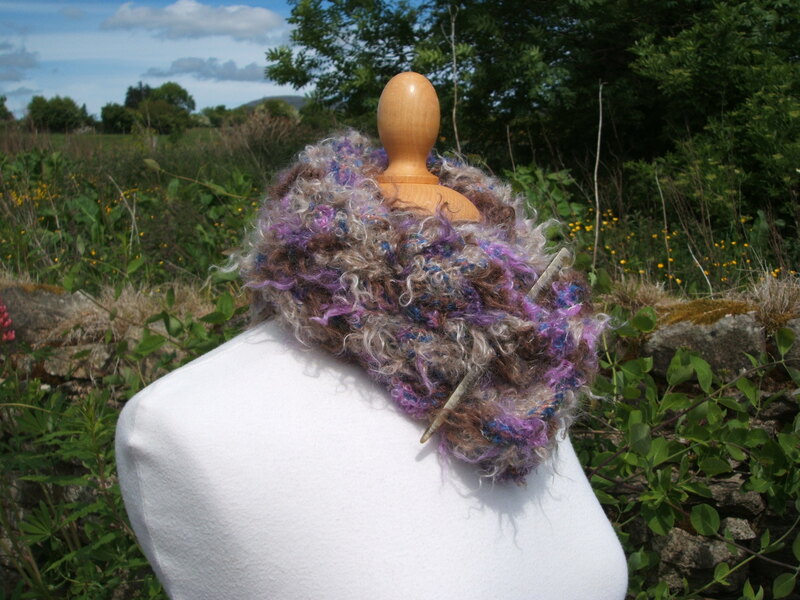 Please email me if you would like to order either the lilac or the ocean blue cowl.